While this may be the opening chapter of the second arc in Ed Brubaker and Sean Phillips's Criminal ongoing, there's actually no better time to jump into this series than the present. Thanks to the book's format, which spotlights different characters in each arc, new readers don't need a crash course in the title's history to understand and enjoy its contents. And, just when he's led you to see a little bit of yourself in the story's lead character, Brubaker throws him into the fire. He shares enough of Jake's daily routine for us to understand just how deep of a rut he's in, before tossing in a twist that neither reader nor character expects. Once you've taken that plunge, it's a twisty, bumpy ride the rest of the way. Sean Phillips has been slamming the ball into the stands so routinely on this series that it's become almost too easy to take his artwork for granted. His style, a blend of the emotion-charged simplicity of Tim Sale and the dark, grimy mood of Alex Maleev, is a perfect soul mate for the tone and personality of Brubaker's story. Phillips's work is subdued and pedestrian enough to duck under the spotlight, but adds so much to the series that I can't say it could be successful in another artist's hands. His connection with the book's routinely shifting cast members is almost hauntingly accurate. This month, for example, he captures perfectly the empty, piercing stare of Jake's insomnia in the midst of a long night. Not quite awake but certainly not asleep, he stares right through the reader like a ghost. He's looking into your eyes, but he doesn't hear what you're saying. Phillips has really settled into this role, and his familiarity with the material is beginning to pay dividends in his already-strong artwork. After being disappointed with the last arc, I was pleasantly surprised by the return to form evidenced by this storyline. 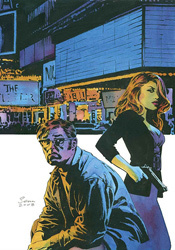 Sean Phillips's artwork has never wavered, and though he's survived some ups and downs elsewhere, this is all the evidence you'll ever need that Ed Brubaker's writing can be, at times, absolutely perfect. This arc of Criminal should be in your permanent collection. Buy it and enjoy it.